Let’s keep Barney where he belongs – on TV; OR, I painted my hideous purple dining room. Back in July we bought a house. It’s a great floor plan and fits our family well. The “bones” of the house are great. But the paint colors? NotSoMuch. I’ve been on a painting spree for months now and have painted the entry way, piano room, kitchen & family room. But the dining room haunts me. I’ve got loads of jokes to insert here, but they all involve Barney and homicide, so I figured I should just not.go.there. But you get the idea. I’ve put off the most visible and by far ugliest room in the house (and on the planet) for one reason. The ceiling needs to be repainted in addition to the walls. I.HATE.PAINTING.CEILINGS. Hate, with a huge big fat capital H.
The other day though, I guess I’d walked past that hideous room one too many times because something just snapped inside me. My hate for the room overpowered my loathing for painting ceilings, and before I knew it I was priming the ceiling at 9pm. I did two coats of primer and then the next day I did two coats of basic builder beige that I had color matched to the rest of my ceilings. I didn’t take a picture of the finished ceiling. What is wrong with me? Bad Blogger! Also, I’ll do a full post with all my paint colors soon, so bear with me. 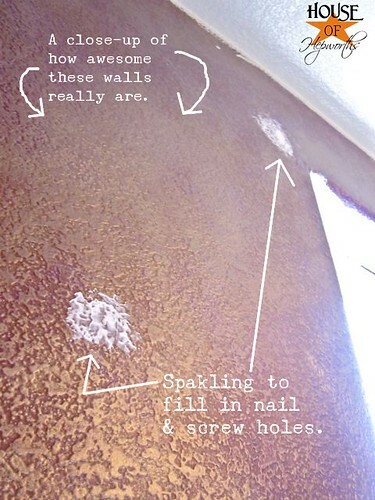 Once the ceiling was back to the way nature intended it, I had to fill tons of screw and nail holes. From there I painted 3 coats of my Slate gray from Restoration Hardware on the upper part of the walls. I didn’t prime first because the paint is dark and think and coated well. Also, I didn’t paint the whole wall because I’m going to add moulding like I did in the piano room. I also removed the moulding from under the little open window thingy. 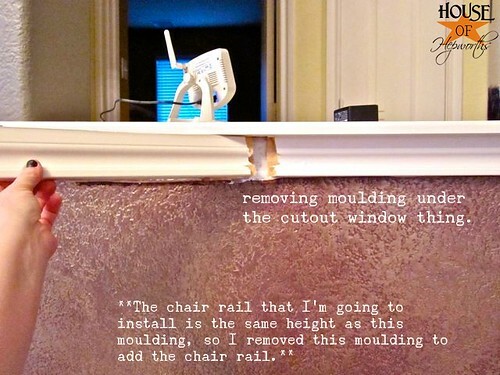 The chair rail is the exact same height as this moulding, so I’m going to just put the chair rail across the whole room instead of trying to patch it to this moulding, which would look really odd and random. *The chair rail height being the same as this ledge is not a fluke. Before I did the piano room I measured this height and matched the chair rail height to this window ledge. Now all the chair rail in my house will be this same height. After all this torture I primed the bottom part of the wall & then gave it two coats of gloss white in SW Alabaster. * Finish painting all the edges. They are just raw and ugly right now. * Hang chair rail & moulding around windows. * Hang boxes under chair rail. 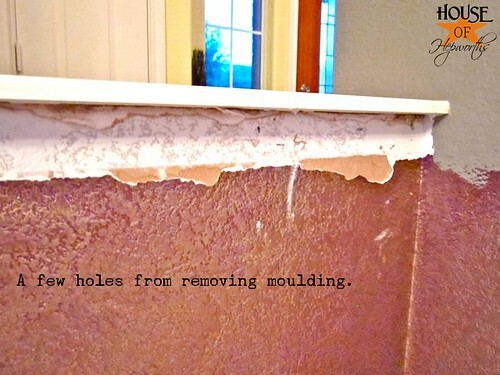 * Caulk everything, paint all the moulding, touch up everything. 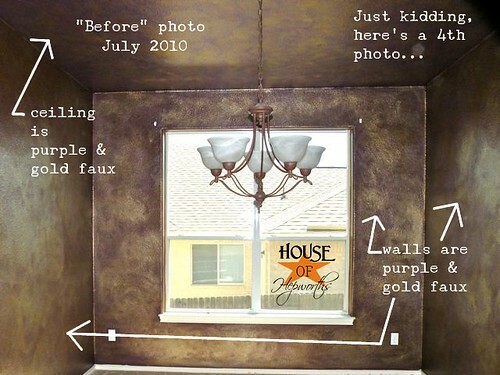 * Take down chandelier and spray paint it. You can get a glimpse of the ceiling in this picture. As I work on this room over the weekend I’ll update you with paint colors & better pictures of the ceiling. The moulding might have to wait a bit though because it’s below freezing and I’m in no mood to go outside to cut moulding on my saw. I’d say this half finished room already looks so much better than the Barney Massacre. See you guys Monday! Have a warm and fun weekend! I cant believe you lived with that room at all! I would have painted it immediately. I can understand hating painting ceilings though. 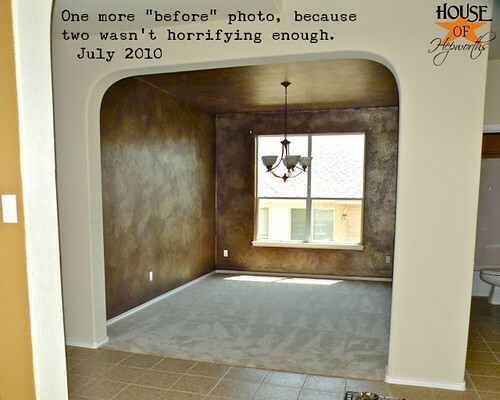 I hate doing that too… Room looks 100% better and it isn’t even finished yet, I can’t wait to see it finished! Looks awesome! 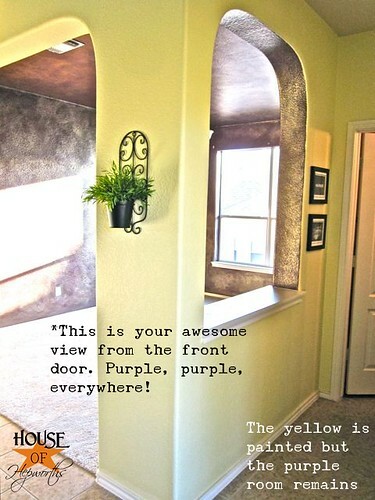 I can’t imagine living with that hideous purple paint, wonder what the former homeowners were thinking?? Looks so much better already!!! Can’t wait to see it all finished! So far, so good! The difference in amazing! I can’t wait to see the finished room! This seriously made me laugh! I looks so much better now. My other comment is totally unrelated to painting. 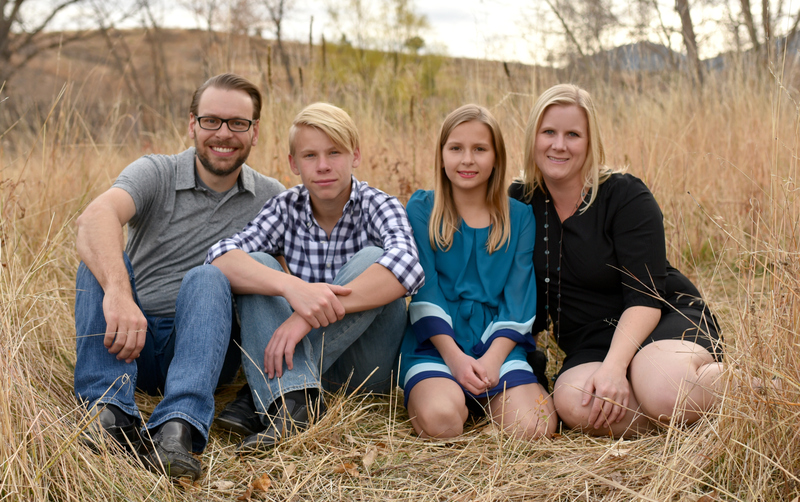 Are you related to some Hepworths in Utah? I have some that live in my neighborhood and own a remodeling/construction business. And every day I drive by their house and see their company trailer, I swear the Hepworth part of their logo is in exactly the same font as yours on your blog. I think of you and wonder if you’re related or if it’s some coincidence and I just need to find more to do to fill up my life . . . It drives me crazy, so I thought I’d just ask. 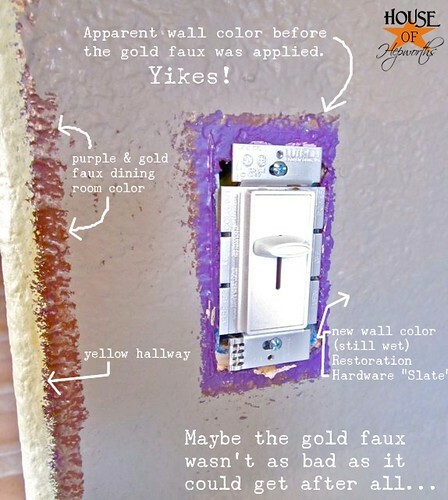 Unbelievable transformation (and you’re only half way there)…the purple paint found under the switchplate is hysterical. Wowsers. You’ve got to hand it to them though, they owned the look…they took it all the way. Enjoy your new room (and ceiling)! WOW! It looks amazing (already!). 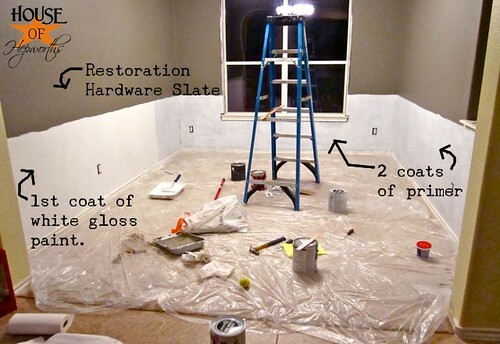 You are one motivated woman…I always love the idea of painting a room, but it’s the finishing details that kill me! yikes that was pretty darn scary i cant belive you didnt tackle that room first! It is looking great! Before it looked like the one eyed purple people eater threw up in there! The new color choices are soooo much better…but I think you lucked out with that faux gold color….the purple by itself would have been impossible to live with! 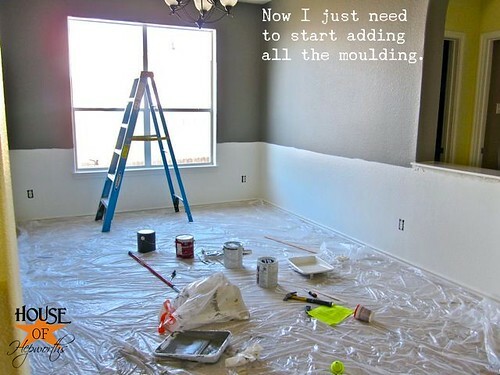 I love the gray that you chose and I can’t wait to see the whole room once the molding is in! P.S. I heard you guys got snow down there in Austin? We got about 5 inches here in FTW…just in time for the Super Bowl! Wow you are motivated! I love the colors you have chosen and can’t wait to see the finished room. Awesome work so far! I wish Barney could go away like your purple walls! Looks awesome so far! Can’t wait to see then end results. 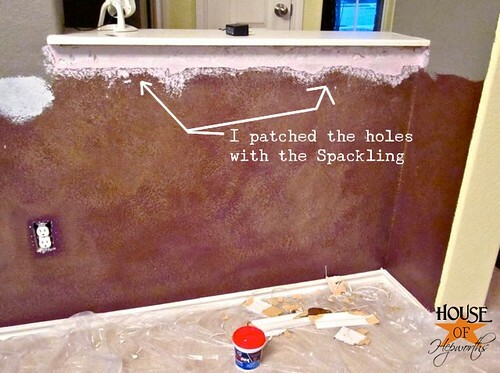 Yay for many, many coats of paint that covered up the heeedeeeous faux! If you had told me that the base coat could have been worse than the faux finish, I would not have believed you… But pictures do tell all. Yowza! And I LIKE purple! Congrats on all your progress. It looks great! Its looking awesome now. Such a big improvement now you’ve removed the dinosaur from the room. lol. That is quite a transformation! It’s fun to imagine the day that colour was chosen! Thanks for sharing the transformation! Ha! I’m glad that I’m not the only person who get a “wild hair” late at night. I always feel the need to move furniture around 10pm. Love the colors and feel inspired to sit here, eat some chocolate, and think about painting….something. BTW. I’ll send my mom to you. She can paint a room like nobody’s business. But you’ve definitely brought it into the 21st century – can’t wait to see the final outcome! Ok, I love it already. LOVE the slate.. very pretty. Cant wait to see the finished project. Who in their right mind would paint their walls purple and gold anyway? I can totally see that before room being so stunning and amazing . . . in about 1983. Your version is SOOO much better! Good work! I just awarded you with the Stylish Blogger Award!!! You can go to my blog for the details!! I am 100% positive the old owners moved out SOLELY to get away from that hideous paint treatment in the dining room! OMG, I’ve never seen anything quite like it. Scratch that, I have. Well, not as bad as your dining room, but bad all the same. Go see Jennifer’s kitchen over at The Old Painted Cottage http://theoldpaintedcottage.com/pages/Kitchen.htm and take a peeky-poo at the cabinets. You did an outstanding job so far on making the dining room look like normal, sane people live there. Kuddos to you, its gorgeous already! Can’t wait to see the finished room. I love the colors you are using! It is looking fabulous!! That purple and gold was absolutely hideous. What were they thinking?? Much better now for sure!! Yikes! I confess, purple is my favorite color, but that paint treatment is NOT good! I have a purple powder room (I promise, not like that) and I love it. 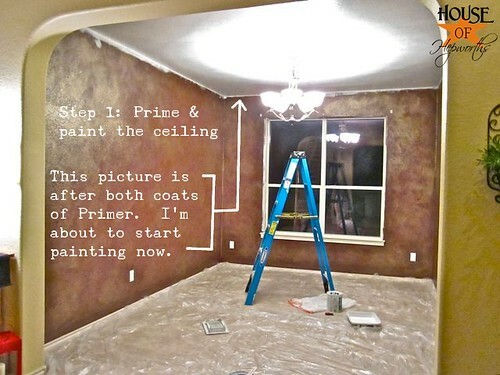 You deserve to win the Lotto just for completing the ceiling primer and paint. 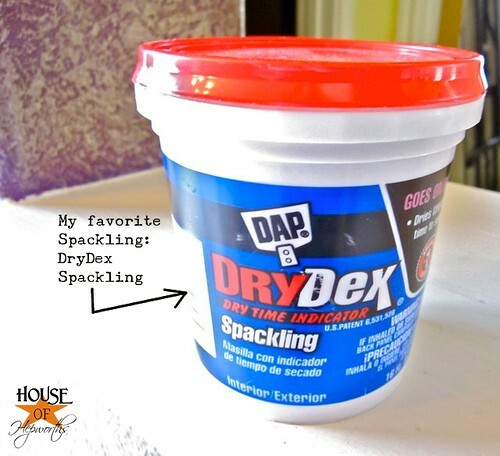 I hate painting ceilings…I have a pain in my neck just thinking about it! Huge job but it looks SOOOO much better. Can’t wait to see when your done. Absolutely love what you are doing to your dining room. What a LOT of hard work !! At first I saw the lack of love for purple in my RSS reader and I was like, hey, hold your horses, I used to have a purple bedroom and kind of loved it, but that was before I saw the picture and OBVIOUSLY I forgot the gold accent so I didn’t know quite how hideous a purple room could be. I just saw a house today in Southfield, MI that had metallic gold vertical blinds, which I think would go really well in here. Also, just got the RH color swatches in the mail yesterday to help me with some paint decisions and the first one my dude picked out was Slate. So glad to see it on the walls… looks awesome for you. Can’t wait to see it finished. Painting a ceiling at 9 pm!!?! what kind of crazywoman does something like that?!??! lolol! 😉 I’ve never heard of such a thing. wow. the purple below the light switch cover is quite the sight! This is incredible! The gray looks awesome. I love it! OMG! Kudos to you because I wouldn’t have been able to get past that room. I think I would’ve turned right around. I can’t believe that the real estate agent didn’t ask them to repaint that…it is hands down the most hideous decorating I’ve seen and I am by no means a Martha Stewart. Oh my! 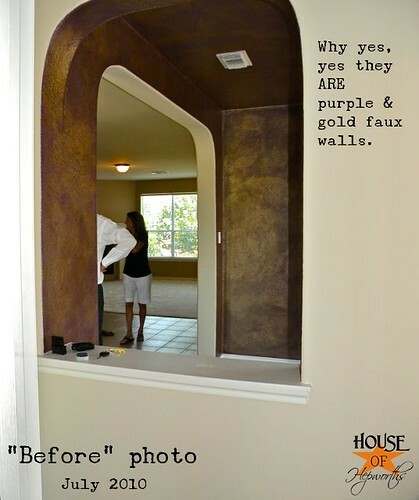 It looked bad…then when you showed us the “before” gold – original purple color – my eyes! My eyes! LOVE the new room. Amazing change. Can’t wait to see the finished product. Isn’t it amazing what a little paint can do? Insert evil Barney MUHAHAHA laff. 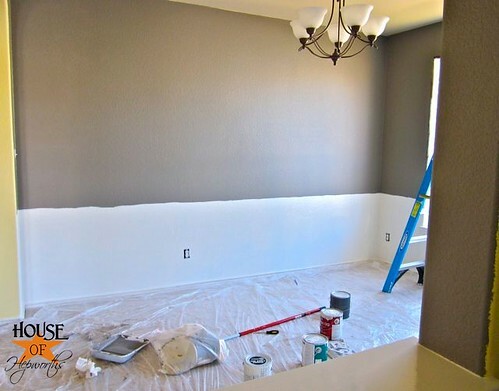 I would be awesome if the previous owners read your blog and saw that their awesome paint choice, is well, not so awesome after all! okay, so from the first pictures to the last I felt myself able to breathe… seriously. i can’t even believe it myself, but I literally didn’t want to breathe looking at that room. OMW I found this post by the link in today’s post (Nov.14,2011) and this is hilarious!!! OMW Barney suicide – I am so laughing out loud here – and the difference you made! Oh My Goodness!!! 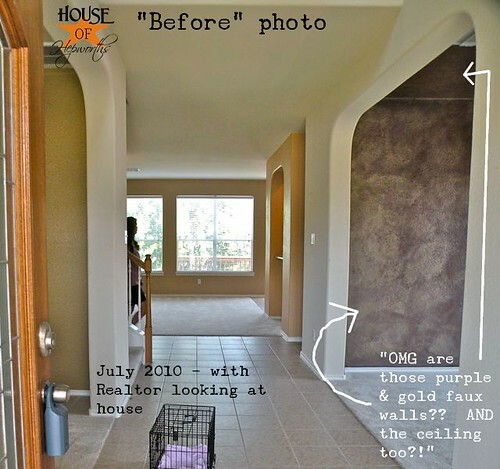 Spectacular transformation – and I so love the snippets/comments about the purple – lol!!!! Oh this room is sooo much better now!!! I’m dying laughing cause you sound like me (or I like you). “something just snapped inside me. My hate for the room overpowered my loathing for painting ceilings, and before I knew it I was priming the ceiling at 9pm.” My poor husband. He’s headed to bed when “motivation” strikes me and he wakes up to a whole new house/project/disaster. LOL Found you on pinterest through the painting meeting lines post. Love it!